Sorry, all we talk about is diving when we are here, but in fact that is all we do here. This island is not exactly a land of plenty. It is from my perspective one dimensional. If you are coming here, come here to dive. We notice at breakfast on the terrace there was no wind. The trees around the pool are perfectly still. (Notice how I tried to instill jealousy by mentioning, outdoor breakfast and an onsite pool.) This has the effect of changing our dive plan for the day that was so meticulously laid out last night. With no wind we will have to check out Lighthouse. It is a dive at the far south tip of the island that is not often dive-able. The surf is too high or the currents are too strong. Today we arrive early, 8:30am. We are the only people there, the waves are as small as they will ever be and when we look out over the surface there is no indication of any current. The decision is to dive. Getting in isn’t too bad and there is absolutely no current. L, the office manager at the hotel we are staying at, has lived here 10 years and has yet to dive this site. We are lucky. Debbie finds an interesting nudibranch, a Purple Spotted Sea Goddess. It is very tiny but one we have not seen before. Although I am sure they are about we do not find too many nudibranchs here. Just before we head to shore we spot a turtle. Always fun to watch how effortlessly they propel themselves. Dive two is another coup. With no wind the kite boarders are taking the day off. The sites near the beach where the kiters start from are usually a bit dicey because the boards they use have a 4′ foil for a keel and if they are not planing this sticks under the water. It would not be good to be hit by one of those. Red Beryl is one of those sites and we dive it today. It is the site that has produced the most interesting wild life to date. 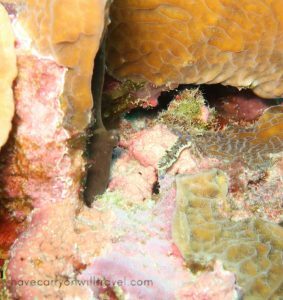 A small crab chilling in a crevice, a couple of Slender File Fish, and a huge Green Moray out for a morning swim. 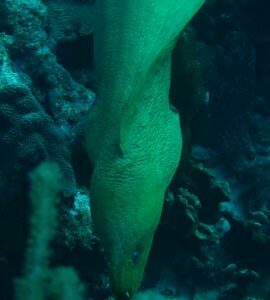 Debbie is small and this eel had her eyed up as brunch but after closer inspection decided against it. The third dive is closer to home, The Cliff. Although not strait down into the blue it is a wall dive, one if not the only wall dive here. 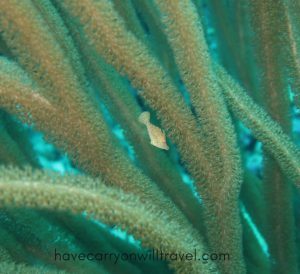 More Slender File Fish are found and a resting Scorpion Fish are the highlights. It is a good day, a really good day. The wind is suppose to be calm tomorrow as well so we will most likely return to kite boarder heaven and use the lack of stainless steel keels to our advantage. This entry was posted in Bonaire and tagged Bonaire, scuba, scuba diving. Bookmark the permalink.